New Zealand's [Removed:17] dominated the final table on the way to capturing the 2016 Aussie Millions Poker Championship Event #6: $1,150 Six-Max No-Limit Hold'em title at the Crown Entertainment Complex on Wednesday. By the time they reached three-handed play, the Kiwi a held 3:1 lead on the other two players combined and agreed to a deal, taking $117,000 in prize money. 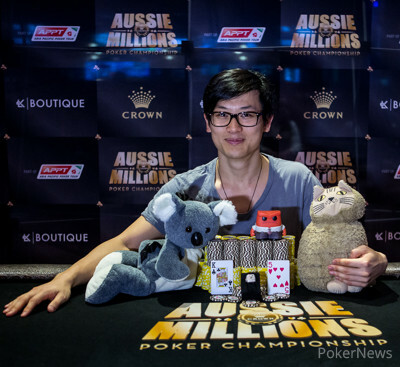 Ashish Gupta earned $66,235 for a third-place finish and Francesco Sergi took $68,000 for second while Yan went on to win the LK Boutique Aussie Millions Championship ring, ultimately defeating a field of 534 players over two days. The tournament played down to the final 16 Monday and returned with Yan in the lead. When Tang Peng busted seventh, fellow Aussie Sam Steindl took the lead into the six-handed final and Yan sat in the middle of the pack. But after Steidel got his kings cracked, doubling up Gupta, Yan moved into the top spot, sending American Derek Wolters home sixth. Yan was relentlessly aggressive the rest of the way and got the cards when he needed them, holding with pocket jacks against a suited ace to felt Max Chin fifth, and ending Steindl's run in fourth when the latter ran tens into his queens. After the deal was made, he picked up pocket aces to eliminate Gupta and simply leaned on Sergi until he had secured his first Aussie Millions title. On the flop , Yan paired up and "MissOracle" held onto the lead with the turn and river as last two community cards. Both players shook hands and Sergi was eliminated in 2nd place for a payday of A$68,000 as agreed by the deal. After a min-raise to 100,000 preflop, both players checked the flop and the 10d] turn. On the river, [Removed:17] bet 150,000 and Francesco Sergi called to muck when the New Zealander flipped over Jh,9d] for top pair. One hand later, Sergi limped in and Yan checked. 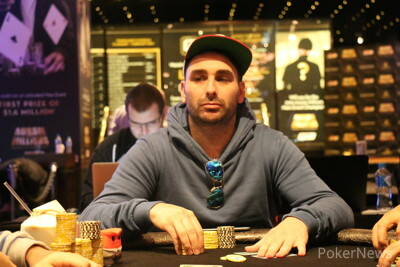 On the flop , Sergi bet 100,000 and Yan folded, he was shown by his opponent. "I didn't put you on that one," Yan grinned. [Removed:17] quickly pulled away further in heads up by sheer aggression and then things got set back to where the duo started. Yan limped in and Francesco Sergi raised to 175,000, which Yan called. They checked the flop , Yan then bet the turn for 200,000. Sergi called and they checked once again on the river. Yan flipped over , Sergi won with the better kicker in . [Removed:17] raised to 80,000 and Ashish Gupta moved all in for over 1.2 million, getting snap-called. There was no help on the board and Gupta was sent to the rail, but remained near the tournament area to talk with friends and follow the action. On the button Francesco Sergi raised to 125,000 and [Removed:17] called. On the flop both players checked. The turn saw another check by both players and then the fell on the river. Yan checked and Sergi's bet of 125,000 took it down. 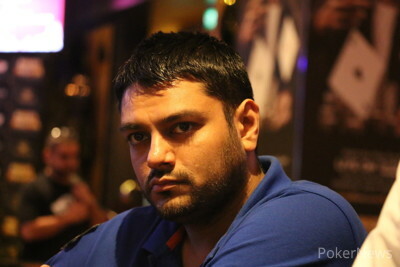 Yan raised to 80,000 from the button and Ashish Gupta shoved to win the pot. Last but not least, Gupta limped and Yan checked in the big blind. The flop was checked through, Yan then faced a check-raise to 125,000 on the turn and called. Gupta's bet of 225,000 on the river was paid off eventually as well and Yan then mucked when he was shown . The players are on a quick break and will then return to play for the LK Boutique championship ring. Ashish Gupta shoved in for 350,000 and and [Removed:17] called with the . Gupta had a pair, the , and it held on an board. With that, discussion of an ICM chop ensued. Celebrate the Lunar New Year at Crown!